Change of scenery, woo hoo! I'm totally not going to regret putting the comic in winter in like ten pages, nope. No way. No regrets. Making it winter. And having to draw snow all over the dang place. One of the reasons I set the comic in winter this time was because I'd only drawn snow like... once or twice before on a couple of pages in the old version and it was hard and confusing because I'd never done it before but in the end I really liked it. 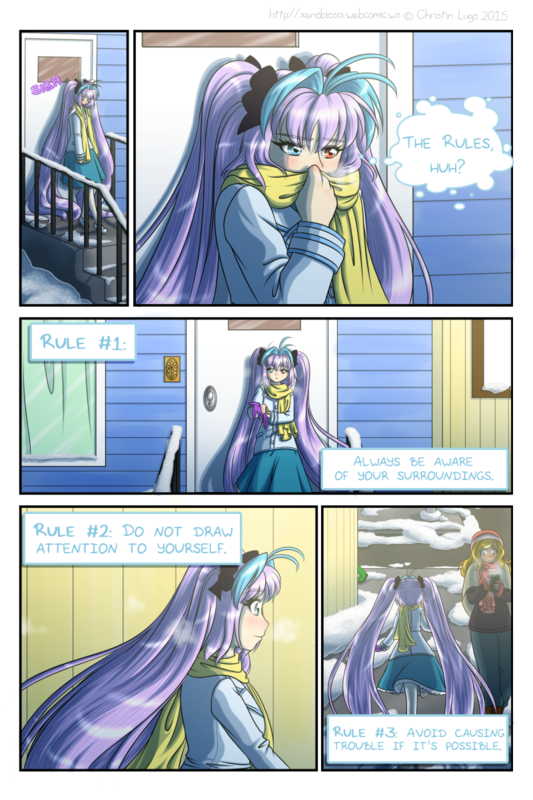 So I decided to challenge myself by setting the comic in winter and this having to draw snow more often. But the more I do it the easier it'll get. Okay I'm gonna do something a little out of the ordinary for these author notes, but it's something I wanna do. My good pal Rufiangel, creator of Serpamia Flare (a webcomic I really enjoy), is hosting a crowdfunding campaign to get her novel published. It's a young adult fantasy novel that's got fighting and action and fantasy stuff and it's probably going to be super amazing. There are digital versions available as well as hard copies so if you like that stuff definitely check out the IndieGoGo page. One of the perks for pledging or whatever it is you do for the campaigns is a special artbook which I've contributed art to, along with a veritable pantheon of other amazing artists. So go check it out by following the link below, I'd appreciate it and I know she would to (she'll also probably tell me I didn't have to do this when she sees this later but whatever :9), even if you can't pledge. I didn't really have much to say about this page. If the color of Lilith's thought dialogue is too hard to read let me know and I'll make it darker. It did show up once before in the prologue but those pages are mostly black so I think it stood out a bit more compared to the pages in the chapter. Well, it's not really a problem then, is it? I mean, if she takes a wrong turn by accident and winds up in the middle of a bank robbery and gets taken hostage it's hardly her fault. I'm thinking Rule #2 might be troublesome, with her long and lovely hair. The winter here looks awesome. There's just something about a snowy scene that... I don't know. Nothing else feels like it. Not really, considering the plethora of rainbow-skinned and non-human creatures walking around. Lilith has to follow these rules because of her 'special condition' that'll be explained later in the chapter. I don't know if I put it anywhere on the site. The site's a bit of a mess outside the pages where the comic pages go and where the archive is cuz I'm slowly updating some things. New pages go up every Monday at 8am PST. There's actually one more rule that hasn't been listed yet. But to be honest I don't think anyone would really like these rules unless they followed similar ones already. Lilith is just a special case and therefore has to abide by them, however sucky she thinks they are. Let's be honest guys, with Lilith *none* of these rules will hold for long. But that's exactly why we're reading this. Pretty guardian Sailor Liliiiitthhh~ *sweet guitar riff* XD You know I feel like not a lot of comics feature snow, it's pretty neat! I'm glad you made that change. I actually have a sketch of Lilith in a Sailor Guardian outfit in my sketchbook lol. Thanks so much, I'm glad you do! There's no stopping her now. She's described most of these rules, now she's gonna go break them! I think the hair goes against rule 2! Haha yeah, that seems to be the general consensus around the Internet. That's nothing compared to the rainbow color skinned people that'll show up later. Haha really? The shape, the color of the outline/text, or some combination of the two? I'm glad you like it though! I really like drawing thought bubbles because they're colorful unlike spoken dialogue. Rule #2: Don't draw attention to yourself. Says the girl with heterochromia and purple hair that falls down to her ankles. Aw, it's alright. I think most of the readers question this so you're not alone. It'll become clearer the further into the story we get. But can she talk about Fight Club? Rinkel, this page is lovely! And somehow I don't think those rules are going to work very well for Lilith for too long...especially since it looks like she's going to trip someone in the last panel there. Haha yeah, the downside of super long hair. It gets caught in doors, sat on, stepped on, and tangled in things. Yeah, I'm sure you won't be breaking any of those rules. Pfft, who would even think of breaking those rules??? They're so easy to follow!